One of the bargain buys of the Inglis Melbourne Premier Sale, this colt is closely related to former Australian champion sprinter Apache Cat. By Kuroshio, a speed ball on the race track and now a promising young stallion under the Darley banner, Shea will give this colt every chance to show the speed that his pedigree says he should possess. 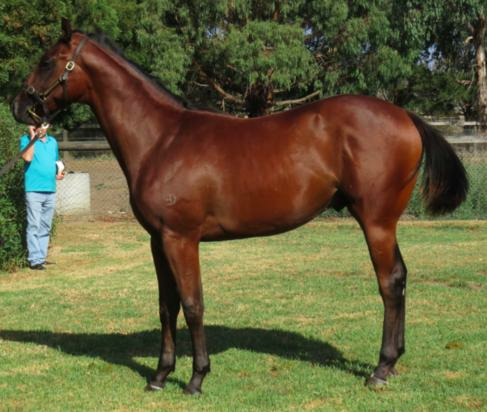 KUROSHIO (AUS) (Bay or Brown 2010-Stud 2014). 3 wins-2 at 2-at 1000m, 1100m, A$327,400, MVRC Ian McEwen S., Gr.2, MRC Blue Diamond Prelude (c&g), Gr.3, VRC Herald Sun Superracing S., L, 2d MRC Blue Diamond Preview (c&g), L, 3d MRC Schillaci S., Gr.2, Debutant S., L. Brother to SW Believe'n'succeed (MRC Blue Diamond Prelude (f), Gr.3). Brother to the dam of SW Bounding. Sire of the placegetters Not Usual Current, etc. His oldest progeny are 2YOs. Hard Charger (g. by Hard Spun). Winner at 1200m, 2d Pakenham RC Evergreen Charity Raceday P.
Lonhgeline (f. by Lonhro). Placed in Aust. APACHE CAT (Lion Cavern). Champion Sprinter in Australia in 2007-08. 19 wins-2 at 2-from 1000m to 1600m, A$4,387,825, HK$1,200,000, VRC Australian Guineas, Gr.1, BTC Doomben Ten Thousand S., Gr.1-twice, BTC Cup, Gr.1, AJC TJ Smith S., Gr.1, MVRC Australia S., Gr.1-twice, VRC Lightning S., Gr.1, MRC JJ Liston S., Gr.2, MVRC Schweppes S., Gr.2, STC Phar Lap S., Gr.2, VRC Blamey S., Gr.2, MRC Guineas Prelude, Gr.3, Schweppervescence Cup, Gr.3, TS Carlyon Cup, Gr.3, Bletchingly S., Gr.3, Meneres BMW S., L, VRC Gibson Carmichael S., L, MRC Bill Duncan 2YO H., 2d MRC Schillaci S., Gr.2, MVRC John F Feehan S., Gr.2, VRC Makybe Diva S., Gr.2, WATC Winterbottom S., Gr.2, 3d Cathay Pacific Hong Kong Sprint, Gr.1, BTC Cup, Gr.1, AJC TJ Smith S., Gr.1, STC George Ryder S., Gr.1, MRC Memsie S., Gr.2, VRC Aurie's Star H., L, Henry Buck's Best Dressed H., 4th VRC Patinack Classic, Gr.1. Liger. 12 wins to 1200m, A$133,900, MVRC Living Legends H., BTC Darley Australia H., 2d VRC Schweppes Tonic H., 3d BRC Montrose Access H.
Tour de Force. 7 wins at 1000m, 1200m, HK$8,332,625, HKJC Hong Kong Golf Club Centenary Cup, CUHK Alumni Cup, Admiralty H., Shenzhen H., Willow H., Panasonic I-Pro Network H., Sha Tau Kok River H., 2d HKJC Happy Valley Trophy, Citibank MPF Services H., Citibank Global Banking H., Fung Mo H., Island H., 3d HKJC Yan Chau Tong H., Cheung Shan H., Sunning H., Bowrington H., Chung Hom Kok H., 4th HKJC Chinese Club Challenge Cup, L.
Victory Vibes. 2 wins at 1000m, 1100m to 2017-18 in Aust. Tennessee Sky. Winner at 1100m in 2017-18 in Aust. Pepperjack. 2 wins at 1400m, 1500m in Aust. Raptor. 2 wins at 1600m, A$82,600, VATC Lobster Cave P.H., Time & Tide H.
Tennessee Charm. 3 wins from 1400m to 1700m, A$85,472, 2d MRC Josephine H., 3d MRC Betfair H., Ricochet Rosie H., Kapalaran H.
Dubawi's Daughter. Winner at 1400m, 3d MRC Chortle 2YO H.
Miss Evangeline. Winner. See above. Hot Chocolat. 3 wins from 1600m to 1800m in Aust. Fremont Street. 2 wins at 1000m, 1200m in Aust. Sport for Short. Winner at 2050m in Aust. Tennessee Darlin. Placed at 2 in Aust. BRUGAL REWARD (Reward for Effort). 4 wins-1 at 2-at 1000m, 1200m, A$260,290, to 2017-18, MVRC Typhoon Tracy S., Gr.3, Ballarat TC Sam Miranda H., MVRC Strathmore Community Bank H., 2d MRC Cove Hotel 2YO H., Argyle Maintenance H., MVRC Synergie H., SAJC Meegs & Rorz Get Hitched H., 3d MRC Le Pine Funerals H., MVRC Roll'd H.
Tennessee Blaze. 4 wins. See above. Yippee-Yi-Yeats. 2 wins-1 at 2-at 1000m, 1200m, VATC Turf Club H., Holiday S., 2d VATC Glenfern H., 3d VRC Desirable H. Producer.